iGNITIATE: You Want Radial Design? Radical Innovation? Through five case studies in radical innovation development, The Nexus of Corporate Entrepreneurship and Radical Innovation concludes that proactiveness, risk taking and autonomy are stimulants where as aggressiveness has a negative effect on development and performance. 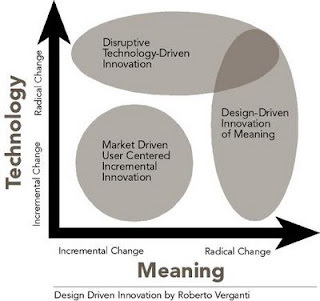 An excellent example and framework for Innovation and disruptive design launches also comes from the work by Roberto Verganti in his seminal work "Design-Driven Innovation" where we can see the necessity for larger and more time consuming efforts to shepard into existence more forward thinking design initiatives. Such an example is the Topiade Moving Pin Building Façade design completed in 2006 and launched in Russia in 2014 at the Sochi Olympics more than 7 years ahead of schedule.